Well a week has gone by and the poll has closed and while during the middle of the week the X-men vs. Street Fighter arcade machine interior, the Guitar Hero 1 game and guitar, and the (yuck) disgusting bunch of used socks were beginning to close the gap, they just couldn’t match the surge in votes that the Horrible Dust Covered Optimus Prime got after the poll first opened. So as my thanks for all those views, one of you “lucky” people could receive the Horrible Dust Covered Optimus Prime you see pictured to the right. Aren’t you glad you know what he looks like now? So how can you enter to win the Horrible Dust Covered Optimus Prime? It’s very simple. All you need to do is make a comment underneath this post to enter. When you pick your email to put your comment under make sure the email you use is valid so that I can contact you if you’ve won so that I can get an address to send your Horrible Dust Covered Optimus Prime to. Remember, I’ll only guarantee to have him shipped within the United States. If you’re outside the United States you might be on your own for arranging shipping. This contest will remain open for new entries until November 1st. Once November first has come around the winner will be randomly chosen by a random die roll, and they will be contacted. The selected winner will have three days to reply to my email, otherwise another winner will be selected. Invalid emails where delivery errors are received will be disqualified immediately. Once I have a winner who responds to the email that winner will be announced in a new blog post. Horray. Can you decode the secret message? As some of you may have noticed I was posting a lot yesterday about how happy I was with the traffic this blog was receiving on Friday, only to be totally be blown away by the traffic this blog received on Saturday. Needless to say I’m overjoyed with this result and in honor of my very first 1,000+ hits in a day I’ve decided something special needs to be done. Something more special than putting together a lame animated gif which shows how all of you completely squashed my traffic graph yesterday. So to decide exactly what that something special should be I’ve decided a poll should be opened to see what out of my collection of useless junk treasured items will be given out to one, or all, of you as a gift to say thank you for all the views. Here are the options for what the “gift” will be in detail, followed by a poll. The “gift” will be whichever item has the most votes by next Saturday. Option 1: Youtube video of the interior of an X-men vs. Street Fighter arcade machine. It’s something I have in my possession, I’m probably going to be giving it to a family member soon, but while I still have it I can film it, and wouldn’t it just be dandy to see the inside of a particle board box with a 25″ Wells-Gardner monitor in it, a Capcom CPS2 board, and Happ controls and coin-mechanisms as far as the eye can see? Probably not, because these things aren’t exactly made to be pretty inside. But, if you’ve absolutely got to know, vote for this one. Option 2: Upload of silly 33 second stop motion video I did back in the nineties. “Filmed” with a crummy digital camera, and put together in Paintshop Pro’s animation shop on a shiny state of the art computer with a 300Mhz AMD K6 processor and encoded in Intel Indeo codec. Wow your friends with your new found knowledge of just how bored a human being can get when stuck in a house in the middle of winter! 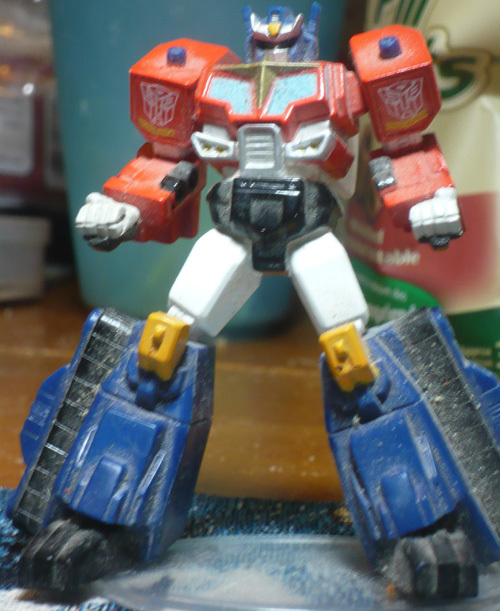 Option 3: Contest for one lucky winner to get this tiny Japanese Optimus Prime PVC collectible statue thingy on my desk. What does he look like? You don’t know! That’s half the fun! I will tell you he stands about four inches tall and is a statue, which means minimal posing, and is fairly chunky and he comes on a clear base. He’s definitely Optimus Prime but he’s some version I don’t recognize with a more samurai looking helmet and just some slightly different shapes to his parts overall to make him much more stylized. He also comes with complementary dust. I’ll pay for shipping this to anyone within the US. International shipping is possible depending on how much it is, but no promises. Option 4: Contest for one lucky winner to receive Original Guitar Hero 1 Playstation 2 game with guitar. Hey, who likes old used and abused video games? Obviously you do if you picked this. If you’re not sure what this is, go google it. Last I time I checked this worked, but hey, who knows! This also comes with complimentary dust. Just like the Optimus Prime Statue I’ll pay for shipping this to anyone within the US. International shipping is possible depending on how much it is, but no promises. Option 5: Contest for one lucky winner to receive a bunch of used socks! Oh joy! Do I really need to explain what socks are and what used means? Why would you pick this? I don’t know, but it seems to work for Carson Daly so let’s go with it. As with the other contests I’ll pay for shipping this to anyone within the US. International shipping is possible depending on how much it is, but no promises. So those are the options for the absolute junk clogging my closet trove of treasures you have to pick form. You may choose all of the options that you would actually like to see, and the option that has the most votes after time is up will be the one that happens. Choose wisely. Editor’s Note: In the case of a tie at the end of the voting period the tie will be broken by a random die roll.